Airport in Slovenian is Aerodrom. Location: 21 km/13 Miles N of the City, near the village of Brnik. General: Taxis wait outside the baggage reclaim area. Approximate Costs: To Ljubljana city center ~€45, takes 25-35 mins. AvioTaxi: Adria Aiways run something called the AvioTaxi from the airport to various destinations including, Bled, Medvode, Ljubljana, Bohinj, Planica, Triglav, Slovenj Gradec, Cerknica, Ribnica, Žužemberk, Litija, Kamnik, Portorož, Maribor, Kranjska Gora, Bovec, Tolmin, Nova Gorica, Pivka, Krško, Rogaška Slatina & Ptuj. It is not clear how or when these services operate. Further info from Adria Airways. MNJ TRANSFER: Operate taxi and private transfers in Slovenia from Ljubljana airport, Ljubljana City and other towns in Slovenia and neighbouring countries with: sedan cars 1-3 pax, limo cars 1-5 pax, mini buses 4-8 pax... To ensure a car and driver, reservations are advised. Drivers all speak fluent English, some of them even more languages, they are all well educated about Slovenia, so they can explaine a lot about what and where are you travelling. Orders over email: info@mnj.si, web page: www.mnj.si or via telephone: +386 (0)41 644 444. Prevozi Fasttrip: Operate taxi and passenger services in Slovenia including: Taxi service and transfers from Ljubljana Airport, Trieste Airport, Zagreb Airport to any part of Slovenian coast and back. A reliable 24 hour taxi service - fast, secure and efficient door-to-door taxi service, competitive rates, experienced, knowledgeable, entertaining and English speaking drivers, air-conditioned vehicles, all your transportation needs. Advanced reservations are accepted but not required. In addition we are fully licensed and Insured. Contact: Tel +38640555083. easyJet bus: A coach operated by Markun meets all easyJet arrivals, and waits across the road from arrivals. It has an easyJet sign in the front window. It runs non-stop to the Air Terminal in the city. 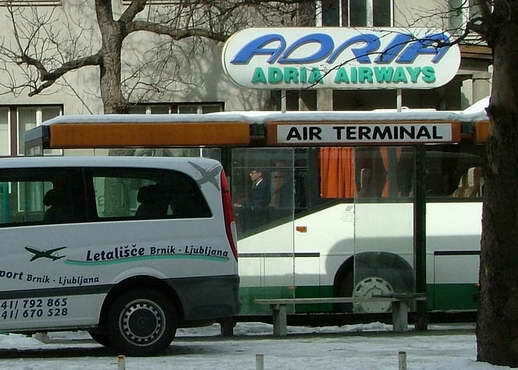 The glamorously named Air Terminal is just a bus shelter with the words: Air terminal & Adria Airways on it. See Photo. It is part of the Ljubljana main bus station, which is in front of the main railway station. The Air Terminal is ~100m W of the entrance to the train station, opposite bus bay 30, between the 2 carriageways of the main road. Timings: Leaves the airport 30-60 mins after easJet arrivals, and leaves the 'Air Terminal' in the city (see left) at 1215 & 1400. Cost: €5, takes 30-40 mins. Public Bus: Operated by Alpetour. Leaves from the main bus station outside the railway station. Bay #28. There is very little room for luggage on this bus. Route: Stadion, AMZS, Stoziče, Ruski Car, Rogovilc, Trzin, Mengeš, Moste, Komenda, Nasovče, Lahovče, Vopovlje, Sp. Brnik & the Airport. Timings: Leaves the airport Mon-Fri at 0500, 0605, then every hour until 2000. On Weekends leaves at 0700, 1000, 1200, 1400, 1600, 1800 & 2000. Leaves the city 10 mins past each hour 0710-2010 Mon-Fri and 10 past the odd hours at weekends. Cost: €4.10, takes 45-55 mins. Markun Bus: Runs every hour or 2 non-stop to the Air Terminal in the city (see above). The stop at the airport is just outside arrivals. Timings: Leaves the airport at 0730, 0955, 1130, 1345, 1500, 1600, 1810, 2150, 2300 & Midnight. Arrives in the city 30 mins later. Leaves the Air Terminal in the city at 0520, 0615, 1025, 1215, 1410, 1530, 1700 & 2230. Cost: €5. Takes 30 mins. Kranj Bus: Runs from outside arrivals to Kranj. Some services run via Cerklje na Gor. Operated by Alpetour. Timings: Runs from the airport once or twice an hour 0521-2200. Less frequently at weekends. Kamnik Bus: Runs from outside arrivals to Kamnik. Operated by Alpetour. Timings: 4-6 services per day. On-Airport Rental Car Providers: Budget +386 4 20 14 300 & ALAMO/National are just outside arrivals on the right. Beyond the entrance to the departure side of the terminal you will find the offices of EUROPCAR 61 684, Hertz 41 659 865, eSixT +386 70 666 664, AVIS 23 65 000, Globtour +386 1 58 84 452, Atlas & Alpetour 20 13 225. 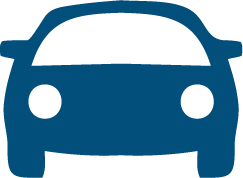 Car Parking: Up to 30 mins free, 1 hr ~€1/SIT 250, 2 hrs ~€2/SIT 500, 4 hrs ~€3/SIT 750, 8 hrs ~€4.20/SIT 1000, 24 hrs SIT ~€6.25/1500. Airport Tel No: +386 4 206 1000. Updated May10 M Nowotny. Last Visit Mar05. Location: 9 km/6 Miles S of the City. By Bus: A bus meets ryanair flights, and runs in to the city. It leaves the city center at 1230 to connect with the departing flight. Cost: €4 one way. By Shuttle Van: 24/7 Transfer Service offer a van service from the airport to Bled, Portoroz & Ljubljana. Tel +386 (0)41 291 800. Location: 5 km/3 Miles SSE of Portorož Town.